When you start to lose steam, head back to the analog station and play. So I went back and re-read that chapter and found something pretty cool. In the preface to Steal Like an Artist Kleon says, “All advice is autobiographical,” that, “when people give you advice, they’re really just talking to themselves in the past.” He describes Steal Like an Artist as a book of advice to a previous version of himself. I’d like to propose Steal Like an Artist as a set of rules for a Transformative Game, one where the goal is to find, nurture and grow your creative self. 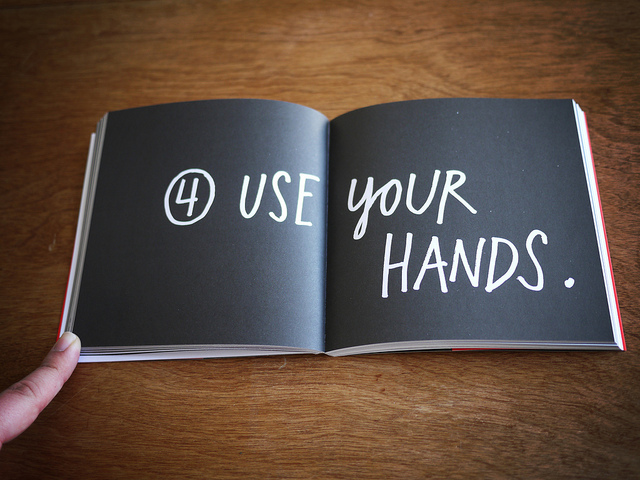 In Chapter 4, Use Your Hands, Kleon describes a creative process that I think is meaningful, and which should be familiar to advocates of playful learning. He separates his creative process into “analog” and “digital” parts, going so far as to maintain separate workstations. His analog desk holds markers, pens and paper, index cards and newspaper, any sort of physical material he can use to create, but nothing electronic. Kleon says, “The computer is really good for editing your ideas, and it’s really good for getting your ideas ready for publishing out into the world, but it’s not really good for generating ideas.” His digital workstation houses his laptop, monitor, scanner and drawing tablet. It is here where he edits and publishes his work. It wasn’t until I started bringing analog tools back into my process that making things became fun again and my work started to improve. “When it came time to sequence Newspaper Blackout, I scanned all the pieces into the computer and printed them out on little quarter sheets of paper. Then I pushed the sheets of paper all over my office, rearranging them into piles, and then a stack, the order of which I copied back into the computer. That’s how the book was made–hands first, then computer, then hands, then computer. A kind of analog-to-digital loop. When I read through this a second time, it struck me: this is the play, information, and reflection cycle of Meaningful Gamification and Transformative Play that Scott Nicholson has been developing and writing about at Because Play Matters game lab and elsewhere. “When you get back to your analog station, pretend it’s craft time. Scribble on paper, cut it up, and tape the pieces back together. Stand up while you’re working. Pin things on the walls and look for patterns. Spread things around your space and sort through them. Play, Information and Reflection. Repeat as needed. 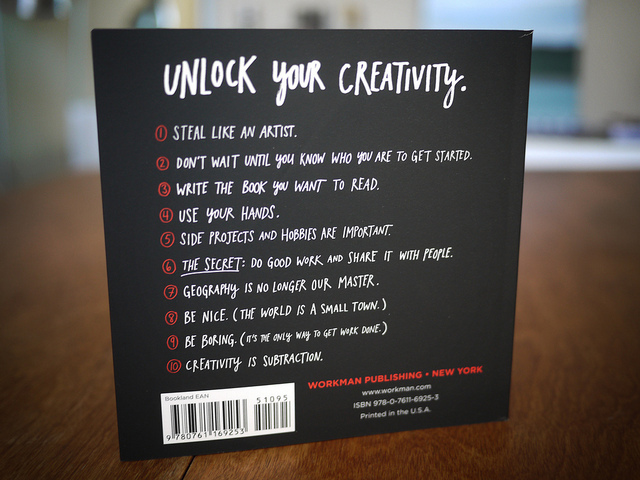 Unlock your creative self. Steal Like an Artist contains vital advice for any creative, but I think many of the lessons are especially useful, directly or indirectly, for game designers. I highly recommend both of Kleon’s books on creativity: Steal Like an Artist and Show Your Work. Show Your Work is definitely on my reading list.